Last year I went to visit some friends who live in a neighborhood down under the Brooklyn Bridge. It’s one of my favorite areas of New York and home to one of the best chocolate shops in the country, Jacques Torres. We visited the shop on a cool autumn morning. It was extremely busy, so we moved through the line and quickly but carefully selected our chocolates which we ate while strolling around Brooklyn. Today’s recipe reminds me of that fun day. What makes this recipe special, aside from the expensive chocolate, is the combination of bread flour and pastry flour. The cookies are large and sturdy with a thick crunchy shell and tender centers. You might have to make a special trip to the store for the flours, but it will be worth it. Note: This recipe has been updated a bit since I first posted it. The original version was shared on a TV show, but the New York Times eventually posted a better version known among cookie lovers as the New York Times cookie or Jacques Torres Chocolate Chip Cookie. For best results, weigh the ingredients. Do not preheat the oven yet because the dough requires chilling. In a large mixing bowl, stir together both of the flours, baking soda, baking powder and salt. In the bowl of an electric mixer fitted with the paddle attachment, cream together butter and sugars. Add eggs, one at a time, mixing well after each addition. Reduce speed to low and add vanilla and mix until blended, scraping sides of bowl. Add the flour mixture and mix until blended, then add the chocolate. Scoop big mounds of dough and set on a parchment lined tray or a couple of plates. Cover with plastic wrap and chill overnight. When ready to bake, set dough on a parchment lined baking sheet spacing about 3 inches apart. Bake in a preheated 350 degree oven until lightly browned, but still soft, about 18-20 minutes. The best chocolate chip cookies ever!! Everything pales in comparison. I made these cookies today and will post about them on Friday. Definitely a great chocolate chip cookies. I can see why they were on your top 10. I used pastry flour then had brain lock and used all purpose flour instead of bread flour (KA red instead of blue.) Cookies were still best I’ve ever tasted. They just weren’t as risen and hilly as photos. Next time, I’ll do it with bread flour and compare. It’s a wonderful recipe. what brand and % of dark chocolate did you use? You can, but the cookies will be a little more dry and less tender. If you don’t want to round up all the specialty flours (and I don’t blame you!) just pick a different recipe. The newest Cooks Illustrated recipe is very good. cae i use all purpose flour instead of pastry flour? These cookies were a huge success! They have slightly chewy, crispy edges with soft centers. Instead of using white sugar I used the same amount of brown sugar. My family loved them! If you leave the dough in the fridge for 24 hours before baking they are even better. Has something to do with how long the bread flour takes to absorb all of the liquid indgredients. Wow, these really are amazing. Made it just like you said, with all the listed flours and they’re incredible. Definitely a chocolate chip cookie for chocolate lovers. I made a dozen and then made the dough into little balls to freeze. I hope they hold up. Now if I can just keep from eating the rest of the ones I baked. . .
Oh, I really want to make these today…but do I want to go on a hunt for the two different kinds of flowers??? Man, laziness really gets in the way of things sometimes. I’m glad to hear the cookies are good when made smaller. I’ve always made them big. I made these for thanksgiving, and i messed everything up, forgot the brown sugar and i think i left out a stick of butter. Did not realize that until afterwards, based on the reviews I thougt they should taste better. So the other day I gave it a second try. Loved them they were so good. I saved some dough and made some yesterday and made mini cookies 1/2 tablespoon, they came out perfect and crunchy the next day. Will definetly make again. Thanks for the recipe. Sam, I’m glad they worked out for you. For a completely different cookie experience, and one that will hold up better, try the Wellesley Cookie Exchange recipe (Best-Ever Chocolate Chip Cookies). These are wonderful, but definitely do not keep well. The texture changes completely on the next day. Still, one of these about 15 minutes after it leaves the oven is as close to heaven as you’re going to get. would make a difference as far as keeping them fresh? BKS, thanks for the feedback. I’m glad to know cake flour works. It’s probably a lot easier to find. Have fun testing them out on friends. My only complaint about this recipe is that the cookies don’t keep very well. They taste good the second day, but they lose some of their great crispy/chewy texture. For maximum effect, you might want to make the dough ahead of time and bake the cookies on Thanksgiving morning. The dough, unlike the cookies, does keep well. In fact, the cookies come out a little thicker after the dough has chilled for a while. These are great. I used cake flour because I couldn’t find pastry flour. Also, instead of the dark chocolate I used 10oz chopped Hershey’s milk chocolate mixed with 8oz chopped Ghiradelli white chocolate (2oz over a pound, no biggy when you’re dealing with chocolate as far as I’m concerned!) I’m excited to take these for Thanksgiving and give to friends to see what they think versus my normal recipe. This very well might take it’s place! Delicious! I think what’s so great about these cookies is their texture. They are crispy on the outside, soft on the inside and have lots of folds. If you want to do a pan cookie, you might as well use a tried and true pan cookie recipe like the one from Nestle. Here’s one that looks good. I made a half of the halved recipe today. The only things I changed were to substitute Smart Balance buttery spread for half of the butter, used 1/2 tbsp. molasses in addition to 3/4 cup white sugar, and added 1-1/2 tsp. instant coffee dissolved in 1 Tbsp. coffee brandy. For flours I used White Lily bleached and Gold Medal unbleached bread flour. The cookies are delicious, but personally, I like nuts and oats in my chocolate chip cookies, especially when the oats are pulverized. 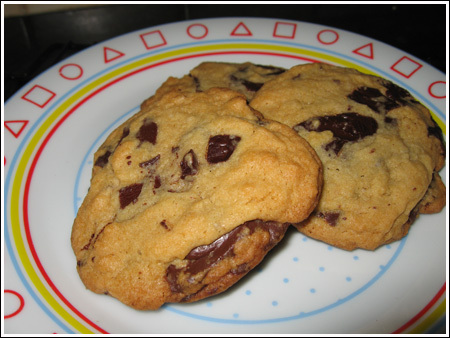 I give this recipe two thumbs up, but I give Todd English chocolate chippers three thumbs up. Also what influences my opinion is the fact that I can’t eat the bittersweet high grade chocolates because, as a borderline diabetic, they put me in orbit. So I used Hershey’s milk and Special Dark (which is only 35% cacao)which agrees with me better, so long as I don’t eat too many. It really is a sad day when you can’t tolerate chocolate. All I can say is, keep eating, you’ll catch up. When I was in my 30’s I could eat anything I wanted….. Does anyone know where I can buy White Lily flour in New York? i have made these………they are amazingly great……. i really like the idea of a ‘secret’ recipe. Pastry flour is similar to cake flour, but it has a bit more protein so the pastry has the tenderness you get from cake flour, but more body….at least according to Ochef. I found mine in the bulk section of our grocery store. I’m guessing Whole Foods has it too. Half pound of butter is the same as 1 cup. Proportionally, that’s the same amount of fat as you’d find in most other chocolate chip cookies. In fact, it’s less. Regular chocolate chip cookies (Toll House) have 1 cup of butter plus less flour and less sugar than these. These have proportionately more chocolate, so that probably levels everything out.